The City Palace Jaipur is one of the most famous tourist place and a major landmark in Jaipur, Rajasthan. City Palace in Jaipur is a collection of royal articles belonging to the raja-maharajas of the past era. The City Palace complex, which is located northeast of the centre of the grid patterned Jaipur city, incorporates an impressive and vast array of courtyards, gardens, and buildings. The City Palace, Jaipur was built between 1729 and 1732, initially by Sawai Jai Singh II, the ruler of Amber.It is a major draw of the city attracting tourists from far and wide. 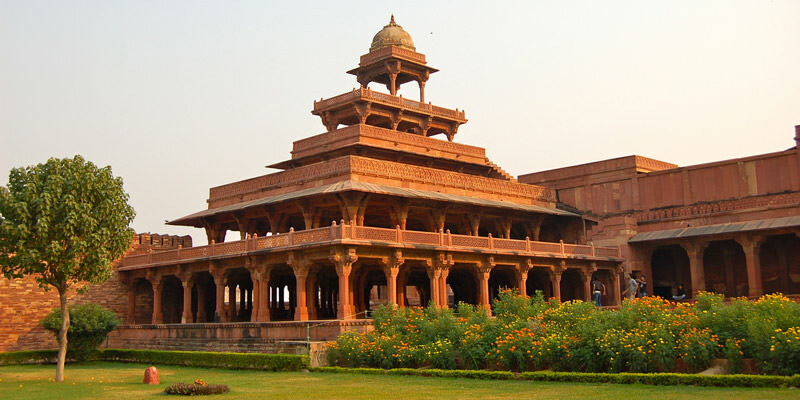 It is a perfect amalgamation of the traditional Rajasthan and Mughal styles of architecture. What is the History of City Palace Jaipur ? Maharaja Sawai Jai Singh started the construction of the City Palace while they were residing in the Amer Fort in Jaipur only about 11 km from City palace. The king planned the Jaipur city along with the City palace due to the rising population and shorage of the water at Amer Fort. The main architect of the palace was Vidyadhar Bhattacharya, who designed the palace and the city according to the Vaastushastra. Every part of this imposing structure captures the hearts of onlookers. City Palace, Jaipur, which includes the Chandra Mahal and Mubarak Mahal palaces and other buildings.The palace encompasses huge courtyards, beautiful gardens, a wonderful museum, stunning halls and magnificent apartments. The two main buildings are Chandra Mahal and Mubarak Mahal and their beauty is worth mentioning. Chandra Mahal : Chandra Mahal or Chandra Niwas is the most commanding building in the City Palace complex, on its west end. It is a seven-storied building and each floor has been given a detailed name such as the Sukh-Niwas, Ranga-Mandir, Pitam-Niwas, Chabi-Niwas, Shri-Niwas, and Mukut-Mandir or Mukut Mahal. It contains many unique paintings, mirror work on walls and floral decorations. All the sectors are true to its name. There is beautiful peacock gate at the entry to the Mahal. It has screened balconies and a pavilion at the roof from where a panoramic view of the city can be seen. There is beautiful peacock gate at the entry to the Mahal. It has screened balconies and a pavilion at the roof. Mubarak Mahal : Mubarak Mahal, was built by Maharaja Madho Singh II with a fusion of the Islamic, Rajput and European architectural styles in the late 19th century. Its arrestingly carved marble gate with heavy brass doors and interiors decorated majestically draw attention. It is a museum; a fine storehouse of variety of textiles such as the royal formal costumes, sanganeri block prints, embroidered shawls, Kashmiri pashminas, and silk saris as part of the Maharaja Sawai Man Singh II Museum. Pritam Niwas Chowk : It is located inside the courtyard which is the entrance to the Chandra Mahal. The chowk as for gates which are dedicated to different Hindu gods and with varying themes. The Peacock gate is dedicated to the Lord Vishnu and represents the Autumn season. The Lotus gate is dedicated to Lord Shiva and Goddess Parvati and represents Summer Season. The third one is called as Leheriya gate dedicated to Lord Ganesha and represents the spring season while the last one is Rose gate which is dedicated to Goddess Devi and represents Winter Season. Diwan-I-Khas : Diwan-I-Khas is one of the most important structure of the palace which used to be the private audience hall of the Royal King. It is located in between the armoury and art gallery. the prime attraction of the hall is 340 kilograms silver vessels which are on display here along with the crystal chandeliers hanging from the ceiling. Also called as the hall of public audience, Diwan-I-Aam is another beautifully designed building with painted with red and gold colors. The roofs of the hall are beautifully painted and the hall features number of amazing miniature paintings , texts, and various sculptures. The City Palace is easily accessible from any part of the Jaipur City by auto-rickshaw, taxi or public buses. The entry ticket entitles only four courtyards of City Palace Premises that tourist can visit including Mubarak Mahal, Sarvatobhadra, Pritam Niwas Chowk, Buggikhana. Separate tour will be arranged known as "Royal Grandeur Tour" for the tourists who wants to visit inner quarters of the Chandra Mahal apart from the usual visitor areas. 6.30 – 7.30pm : Visit the museum and City Palace (visitor area). 7.30 – 8.00pm : Sculpture Lumière Show Palace. 8.00 – 9.00pm : Visit the museum and City Palace (visitor area). 9.00 -10.30pm : Buffet Dinner. Nice Place but its too expensive to visit it’s inner buildings. We visited only the exteriors of the Palace and museum. It;s whooping 2500 for that tour so we declined it. Anyway it was amazing place though and a must visit if you are a history buff. Great Place in Jaipur. Though Amer was more amazing. We loved visiting city palace too. It gives me goosebumps as how luxury the life of the royals would have been in historic times. The museum in city palace Jaipur is well maintained and it was also not that crowdy as we expected. Amer Fort is the real gem here but this palace at to its beauty. A must visit place if you want to explore the history of Jaipur. here you can find full details of jaipur city palace including palace history, open timings of Maharaja Sawai Man Singh II Museum, city palace image gallery, ongoing activities and events in city palace in jaipur. interested to see beautiful photos of city palace jaipur.